Netputing » Get some Flash on the iPad! Get some Flash on the iPad! As you know by now (I hope) Flash is not supported on the iPhone nor the iPad. But Flash is used on most web sites out there. So how do you get to see those sites properly on the iPad? There is a free iPhone app (hope they will upgrade to iPad native soon) called Cloud Browse. This nifty application allows you to remotely control a full version of Firefox, enabling you to access websites that have Flash. 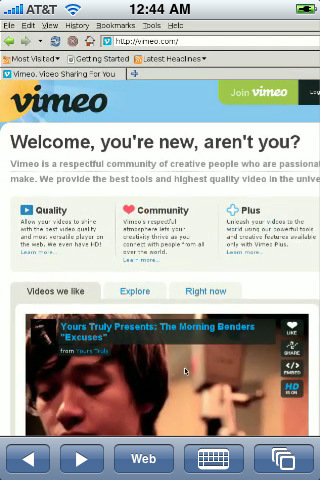 So that means streaming video websites such as Vimeo, Justin.tv, etc. How does Cloud Browse work? Cloud Browse goes beyond the limitations of a mobile device because it doesn’t use a scaled down web browser. Instead, a full desktop browser is running remotely and being streamed to the iPhone/iPod Touch. The remote browser have access to higher bandwidth, more memory and faster processor than that of any mobile device. Worried about privacy or security? Because Cloud Browse runs the browsers on a remote machine and not on your iPhone, there is no need to worry about websites grabbing your private information or leaving a trail of your browsing history.